It may be chilly but the sun is still shining in these parts! The whole plan to use every second of summery weather for my wool prep. hasn’t taken off – yet. What happened is that I went into Toronto yesterday for a v. important document. The ulterior motive was to hit up Romni Wools for a book on spinning. An older man related a touching story about his family split during WW2 after fleeing Ukraine for Canada. After a lifetime apart, the long-lost cousins recently make contact. He really had me going. Yeah, cousins all named after them for their charmed existence here in Canada. I nearly gave him an, “Awww.” Except the story changes, and dude is edgy about the relatives. They are maybe too needy. It was all I could do to keep from dropping a DPN. He out & out says that yes, they bear the family resemblance but it’s time to detach. His Dad always said they left for a reason & must live the good life now. In the same voice as before, dude muses that he lived his whole life without knowing them. In the next breath, he went into his Christian denomination. Nice, eh? The 2 women right beside me gossiped about their ministry jobs. Seriously, ladies, it isn’t code if you use names! Already I can tell we won’t have a repeat of my first winding off disaster… And now I can fix the disaster too! The internet has been great for showing me the basics but I needed a hard copy with pictures to go any farther. While there, I had to get some Rowan Calmer. I have a library copy of Amy R. Singer’s “No Sheep for You,” and am intrigued. The idea is to see if this will be a better choice for Sierra’s care package. I do realize that it’s not machine washable. That’s a big draw-back. On the other hand, some babies are allergic to wool… I will swatch carefully & get back to you. I didn’t make it to Pub Night this week. It was right after I took FIL to the airport. Let’s just say that the heroic amounts of cooking, cleaning, golf watching & general companionship took their toll. In the last few days, DH was sliding to his cozy basement like all the time! So my tired & headachey self took an executive decision and stayed in. I was aiming to go to tonight’s Sit ‘n Knit at Spun but DH makes a good point… rush hour is still on & the traffic is heading thataways! Happy World Wide Spin in Public Day when it comes! Categories: In the Pipeline, Spinning, Stash in; Stash out | Tags: Baby gift, Books, knitting in public, socializing | Permalink. 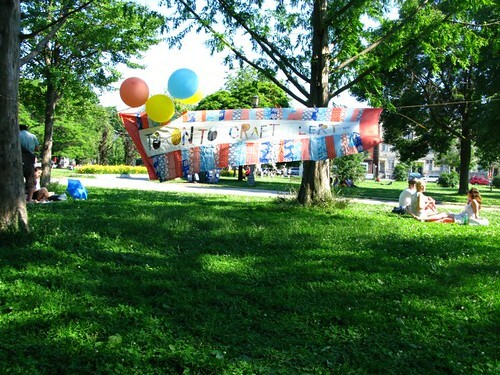 More photos are over at the Craft Toronto Flickr Group. Big up to the TCA! They finally got a sunny day, and it looks like they had a good turn-out. Speaking of crafters… in an hour or so, I’m going next door for a jewelry show. This is the tennis partner neighbour & she’s the maker of said jewelry. I’m interested to see her work, but know full-well she is looking for buyers. Since she got me to play tennis with a wooden racquet, we already know she is persuasive! It’s fair to say that I am working on the finer points & politesse of admiring-but-not-buying. Toby, bless him, is in everyone’s bad books. He just had to freak out at 1 a.m. Whereupon, DH tried but did not succeed at being calm/ assertive; I hop-tripped over a cord in the dark – ouch; and Toby kept up a fine racket for at least 20 mins. Right now the wretch is the very picture of serenity, catching up on his sleep at my feet. With luck, I’ll have the 2nd yellow & white sock finished soon. Just 2″ of foot left to go. Given his sleep deprivation, DH was mighty perceptive this morning. Says he, “You know what you need? A new project!” Yes I do. My cardigan makes sense in theory but it’s firmly on hiatus until I am back to the home-alone routine. I can’t hit my yarn shops but do have great stash to work with. Next post has to be a rant about the Interweave Books summer sale… but now I have to run. Categories: Good Gnus, What I'm up to | Tags: Interweave Knits, knitting in public, socializing, Sock, Toronto Craft Alert | Permalink.